The beakers are bubbling over here! I was browsing YouTube and came across a video explaining how to do a gesso resist with watercolor. I’ve never tried that! And an idea for last night’s painting (finally!) was born. < Freedom: Welcome to World Watercolor Month, Day One! Fantastic!! Space meets underwater mystery! Thanks, Johanna! So glad you like this! OMG I love this one! Blues and greens are my favorite colors and this is just stunning – especially with the texture. The round shapes are soothing – very nice to look at. I’m new to watercolors so I don’t understand everything you’re talking about but I’m trying to learn and understand. Oh, Carol, if you are new to watercolor, you are in for a treat. It can be so much fun to just watch it do its own thing. I am so happy that you love this painting. It was really just an experiment in combining acrylic gesso which is a thick white paint that has a little bit of grit, which we call tooth, into a painting. The gesso should resist watercolor paint because it’s basically plastic (although you’d never know it). It does resist it, but not fully, which is why artists use gesso resist to create paintings. It brings a really interesting texture to the work. I’m so glad you’re enjoying my work. Let me know if you need help with anything, I bet I could point you to a resource or something that would help! Thanks again for taking a look, I really appreciate it. I love it! I see earth underwater though but still…its beautiful! Happy weekend! Thanks Carrie! Same to you! Oh that’s so much fun! Thanks, Kathy! I may have a before pic I can email you of this one. It’s pretty dynamite. You think sheer white would do nothing but its like a miracle. Another amazing creation. Love it. You’re too kind, and thank you Teresa! Love this bubbles 😍Perfect Colors ! I love the colors and textures! It reminds me of Hydrangeas. A frame worthy piece! Hope your Holiday week-end is fun and great too! Do you have any future plans for a gallery show somewhere? You certainly have creates quite the volume of lovely work! Wow, Graham, thank you for your time and generous comments. I am quite surprised and appreciate your analysis. I will think about developing something like this further. Again, thank you. You too, and your family Jean! Have fun! Glad you enjoyed the painting! Gorgeous painting, love the mix of textures and layers of color. The shapes and composition add to the visual feast. Thank you for sharing the process and the art. Thanks so much, Haunani, I’m happy to help with any tips that may help someone else; glad you enjoyed it! Wow! This is one of your best paintings. I have handblown glass balls similar to the colors of your painting. I love to put them in a birdbath. They bob and float with the summer breeze, which is mesmerizing and relaxing to watch. Your painting captures what I see in my birdbath, minus the birds. 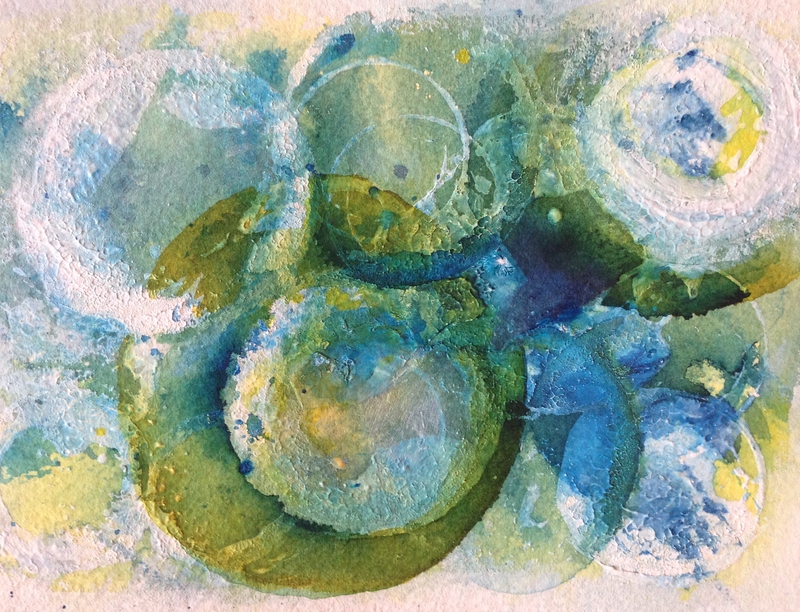 Thank you for sharing your experimentations of mixed medium with watercolor. So interesting. Thank you so much, Connie, I really appreciate your kind encouragement. I Love the image this called up for you! Sounds like a wonderful image there, Donna, love it! Thank you! Gorgeous painting. I like the method you used. I have a large pot of gesso that I want to do magical things with. Thank you for sharing this new technique. Wow, thank you so very much. I’ve been really happy with the generous comments on this painting. I really appreciate you stopping by and letting me know how you feel. Have a dynamite weekend! A very nature inspired response from me here Laura, possibly eyes of the spider? Sounds cool to me, thanks Denis! It reminds me of bubbles too! Love it! Yes, I love this. It takes me to nature and makes me very happy. Glad to hear that, thanks Cathe! A seriously brilliant piece of work Laura! The complement colors, mixing with various interlocking sphere shapes – wow love this one! I think it will turn out beautiful – hope you go for it. Okay, this l really love. It’s amazing. I can see the test tubes bubbling and the brain waves happening! I am so glad I came across your site at The Dune Mouse. I retired last year and now can finally begin to do more art and a lot more writing. I have been dabbling in water color but am quite intrigued with your mixed media using acrylics and gesso. The above is simply beautiful. Emily, I’m so flattered! Thank you so much! I should tell you that this one is about 5 x 8″, roughly. I try to put the size and the surface in every post, but on this one I missed both – it is on 300 lb. Arches 100% cotton rag watercolor paper. After getting lots of great feedback on this one, I’m thinking about taking it to a larger piece of watercolor paper, or perhaps a canvas, and seeing what I can do with it. Not sure if you’re still interested in this small piece? Thank you very much. 🙂 It has been one of those days, but I will be in touch via email. Not sure if you got a chance to see my hummingbird painting? https://createarteveryday.com/2016/07/08/happy-hummer-draw-a-bird-day-july-issue-and-100-face-challenge-69/ Your photo was so, so helpful. What an amazing image of a bird that is nearly impossible to capture. I did..but I’ve been so crazy busy today – 14 hour work day. Phew !! Gorgeous sketch. Absolutely loved it and thrilled that my little picture inspired you. How could it not? Thanks, Emily. Really glad you shared it! Amazing image. Well this is just fantastic! I feel like I’m on the beach, standing by the seashore looking for seashells. As the frothy sea rolls over my toes, I stoop down to peer into the bubbles depths and am able to glimpse a brief look inside some distant world. The bubble pops and I am disappointed by the loss only to be captivated by the bubble that was hidden underneath. Are these places in the past, present, or future? Is this what time travel looks like? Thank you! It almost didn’t get posted. Sure glad I did! The feedback on this has been really helpful. What you’ve achieved here is really impressive! I never would have thought you could get this look with watercolor. I’ve also never mixed watercolor and acrylic, so certainly need to do that soon. Thanks for the inspiration! This is gorgeous! I find the way you go about developing your abstract painting inspiring. Loving it. I’m happy I find this blog. There is so much to catch up with now though. One step at a time…. Lol, same. I could stay on the blogs forever and I do think yours is another that would be like that for me too. Really nice to meet you! Thank you very much, by the way! Oh insomnia keeps me from having my head thoroughly screwed on in the morning lol.